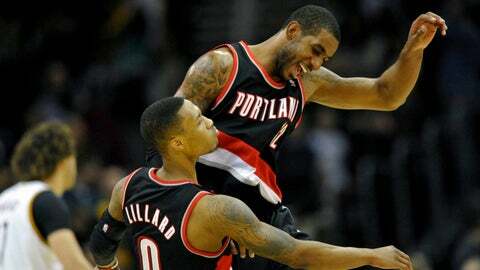 Portland Trail Blazers power forward LaMarcus Aldridge (right) celebrates with point guard Damian Lillard (0) after Lillard's game-winning, three-point basket at Quicken Loans Arena. CLEVELAND — The Cavaliers got a major taste of prime time Tuesday night at The Q, and they learned they’re getting closer to it. But they’re not quite there. Not yet. It came down to a young point guard, with the ball in his hands, with the clock winding down and the game on the line. And Damian Lillard sized it up and drilled it. Final score: Portland Trail Blazers 119, Cavs 116 on a night that lasted until the final shot. If anything, we learned that defense wins championships, but offense can carry you a ways, too. The Blazers are averaging more than 117 points in their previous seven games. They’ve won all but one. Overall, they’re 22-4. They’re smart, they move the ball, they play extremely hard. “Terry Stotts is doing a terrific job with that team,” Cavs coach Mike Brown said of the Blazers coach. The Blazers basically have everything going for them, and it starts with Lillard and power forward LaMarcus Aldridge. Lillard is in his second season and the reigning Rookie of the Year. He’s an old-school type, setting up his teammates then playing off of them. But he’s also a modern-day type, using bursts of quickness and deft shooting to haunt opponents. Lillard plays with an Allen Iverson-like heart and a winning mentality. His buzzer-beating game-winner against the Cavs was his second in two road games (he also did it Sunday at Detroit). And to think he may not even be the Blazers’ best player. That honor probably goes to Aldridge. The 28-year-old power forward is having a career year, an MVP-type year. Cavs forward Tristan Thompson actually did an admirable job on Aldridge most of Tuesday. But the box score shows Aldridge finished with 26 points on 11-of-22 shooting, with 15 rebounds. Honestly. For the Blazers right now, the good news never ends. The Cavs (9-15) are a little different story. They’re better than they were a few weeks ago, and because they are blessed with an Eastern Conference affiliation, there’s still plenty of time. They look a lot better in the losses recently, but are still having a tough time making the winning plays necessary to beat the top teams and build major confidence. Brown’s defense is a work-in-progress and the offense is too often uneven. The Cavs started the game by locating 7-foot center Andrew Bynum and letting him go to work. It resulted in Bynum scoring 13 points on 6-of-12 shooting, and the Cavs taking a 59-55 halftime lead. But Bynum never got another shot. Later, guard Dion Waiters got hot and went on a mini-run, enabling the Cavs to overcome a second-half deficit and go up 97-92 in the fourth. Kyrie Irving also scored eight quick points in the third. This is all fine, and it will win you some games. But the Blazers kept the ball moving and continued to get looks for all of their many capable parts. The Cavs aren’t awful in that area — but they certainly can afford to get better. Waiters and Irving each finished with 25 points, the latter of those two coming especially alive late to give the Cavs a chance when most seemed lost. Irving also finished with 10 assists. Of course, the biggest difference was the Blazers’ rebounding edge. The board work by Aldridge, Robin Lopez and Joel Freeland created a lot of second-chance opportunities, and nearly every one buried the Cavs — as the Blazers yanked down 18 offensive rebounds that resulted in 35 points. Eliminate, like, three of those, and Cavs win. “That’s the game right there,” Waiters said. Yes it was. But it’s certainly not the season. With lessons like these, the Cavs can still climb to prime time. They’re not the Blazers, but hey, maybe they’re getting there.